To commission a thanka please email me at kaylakomito@yahoo.com, and include your telephone number so I can call you and we can discuss your needs and interests. To facilitate this process here are some commission guidelines. My commissioned works are developed in close consultation with my clients. That is the advantage of having a painting commissioned -- you get just what you want. 1) I need to know the name of the Yidam/Buddha to be portrayed and if it has special details because of linage associations, etc. 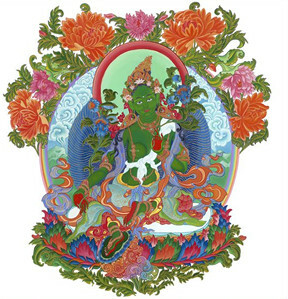 2) I have a large library of Tibetan art, so if you can find a traditional image of the yidam that you are drawn to in a book or on a card and either give me that information (if it is in a book that I have) or send me a color zerox, it can be very helpful for me to understand your unique aesthetic sensibilities,. When I do the painting I take this image into consideration as well as drawing from the most excellent versions of the yidam I can find. 3) The size of the thanka. Some basic guidelines I give to clients as a source of reference are 16 x 20, 18 x 24, 22 x 30, 30 x 40, 40 x 60. If the image is very uncomplicated I can go a little smaller, such as 11 x 14, but feel that the more complicated images deserve a larger format and that the client, in the long run, will be happier with the refined detail possible in a surface larger than 11 x 14. The "actual size" of the painting, of course, will need to correspond to the proportions of the thanka, if the one chosen is to be copied directly with all its elements. Also, what size is appropriate for your meditation? 4) What details do you want in the thanka besides the central yidam? There are traditional "fierce deity" and "peaceful deity" landscapes and offerings, but even these have a wide variety of elements from which to choose. I am happy to do the deciding for you based on my experience, but also will be happy to have your input. 5) What buddhas/gurus/protectors would you like to have in the thanka, besides the central yidam? Again some are traditional combinations such as the protector Kalarupa with Yamantaka or Tsongkapa in a Gelupa based practice, but it is really up to you as to what and how much visual information is helpful. 6) What style of thanka? Some of this information will be available to me as I consider which thankas appeal to you. Again I am happy to use my best judgment in regards to a traditional style but need to know if you have something specific in mind, such as a black thanka. 7) What price? The price is based on the information I glean from the answers and images of all the above questions. As you can see there are many factors to be considered which makes it hard for me to do an estimate until I have this information (for example: a 16 x 20 thanka with a single image in a simple landscape with offerings will be very different in price from a 16 x 20 thanka of the same yidam in mandala palace with accompanying gurus, protectors etc.) The extent of detail, size, complexity, number of hours to be invested, etc., all have an impact on the price. Though the unknowns in the pricing at the beginning of the negotiation process may seem unsettling, it is the result of me working with the client to their specifications and needs, rather than just turning out a selection of thankas based on my decisions. 10) Framing? I do not do framing or Tibetan brocades for the pieces (leaving this to the unique taste and budget of each client). The thankas are done on 100% rag/300lb. D'arches watercolor paper with light fast Winsor Newton Watercolors and Gouache. They cannot be rolled and can be shipped most safely unframed and packed by professional art shippers. 11) The artist retains copyright (i.e., rights to reproduction) of the image.